I met the sweet Dotson-Kelly family back in 2017. They are both from Southern California and have so many connections to our sweet village of Claremont: from the high school drama department, to the violin maker (you know that adorable shop in the village! ), and even to our summer CEF SLICE program where they both taught. Well, they welcomed their second girl in November and were already pros at the whole parenting gig. 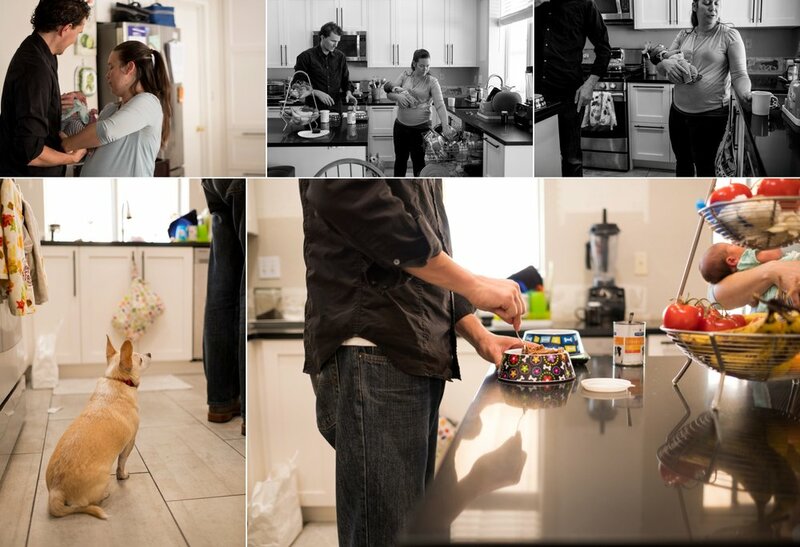 Within a week, they were making coffee while holding a newborn (an essential skill) and reading books to their 2 year old while comforting the baby and making breakfast for their dogs. I wish I was that capable when I was a new mom of two under two. I love that we were able to capture a slice of their real life with their new baby. Please enjoy their film and then the images below. 9:20am - Newborns and toddlers live according to their own schedule, so everyone was up (even the dogs!) and ready by the time I was able to whip out my camera. Every newborn arrives into a family and is instantly part of a coalition that has existed for thousands of years. This new baby’s family has a past that goes on for generations. Though this baby may be a new fresh life, they are also continuing the priceless line of people who love each other as well as the baby. It struck me throughout this session how this new little girl arrived as the family was still remodeling their kitchen and figuring out where to place appliances and furniture. Life continues on as a new life begins. 9:30am - Time for coffee and to tend to their first babies: the dogs. 9:45am - Another outfit change for the littlest family member. These sisters are already creating that unique bond that should last a lifetime. 10:00am - Apparently it’s time for big sister to take charge and introduce her baby to all the toys and books. 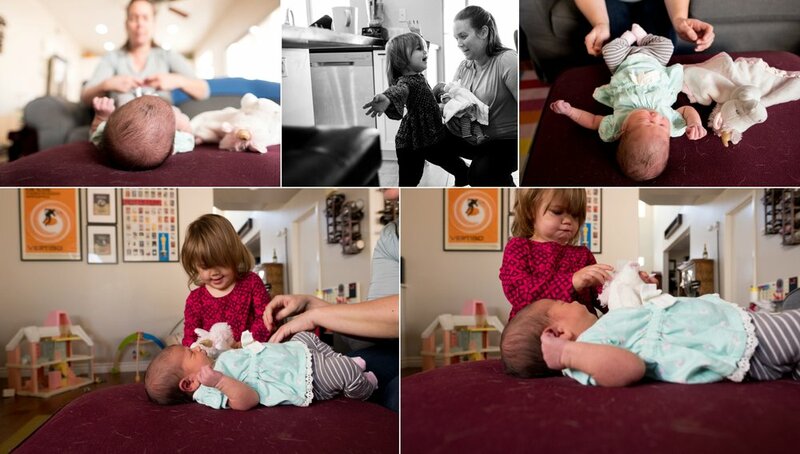 10:20am - While her new “baby” naps, big sister soaks up the undivided parental attention. 10:45am - What do most families with newborns and toddlers often find themselves doing? Cuddling on the couch (with dogs too!) with many toddler-level books. What memories of your family would you love to preserve forever? Let’s grab coffee and create a session that perfectly captures your family as you are now.